In this photo provided by Jay Rutherford, smoke rises from a burning truck packed with fireworks after it exploded on Interstate 15 near Ivanpah, Calif., close to the Nevada state line Thursday, July 2, 2015. The Chevrolet box van had ignited shortly before 1:30 p.m., burning to the ground and clogging the main artery between Los Angeles and Las Vegas for hours. 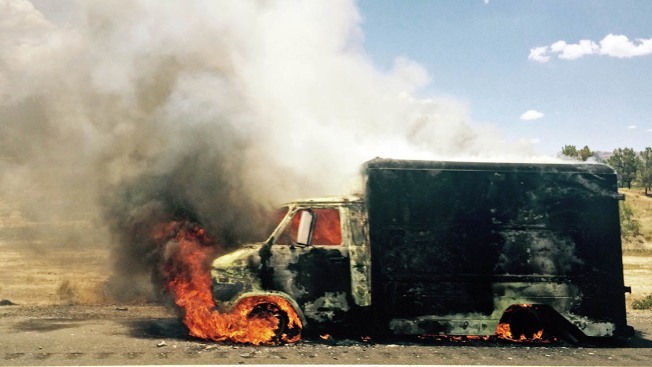 Jay Rutherford and his bandmates were mesmerized by the billowing smoke and small "psychedelic explosions" emanating from the van on the side of the freeway. "We had the fantasy it was filled with fireworks because it was exploding," Rutherford told a reporter by phone while still on the road from Las Vegas to Los Angeles. A minute later, he was incredulous — "It was? Are you serious?" The Chevrolet box van was packed with fireworks and had ignited along southbound Interstate 15 Thursday near the Nevada border shortly before 1:30 p.m., burning to the ground on the side of a Southern California freeway and clogging the main artery between Los Angeles and Las Vegas for hours. The van closed southbound lanes for nearly an hour and backed up traffic several miles into Nevada, said California Highway Patrol Officer Ryan Camara. No one was injured. San Bernardino County firefighters found the van entirely engulfed in flames and the popping sound of fireworks going off, said spokeswoman Tracey Martinez. Rutherford, 31, was driving to Los Angeles to continue a two-week tour with his Nashville, Tennessee-based band Los Colognes when group saw the billowing smoke and stalled traffic ahead. They drove by at 15 mph, watching sparks spiral off the van parked on the side of the freeway. Their guess was the sparks were the result of fireworks or an ice cream truck that caught fire. "We thought it was a truck filled with fireworks that got too hot because of the way sparks were spiraling out of it," Rutherford said. "There were mini sparks and explosions going on. It appeared alive and dynamic unlike other road fires I've seen." The van driver fled before authorities arrived and hasn't been found.